Bohemia Interactive intends to make Arma 3 and its modding tools available long before release. Arma 3 is certainly sizing up to be one of Bohemia Interactive's most anticipated titles. The game features a fully explorable 270 square kilometer island, single and multiplayer missions, and the community tools behind the popular DayZ mod. Arma 3 will be launching in Q3 2013, but Bohemia would actually prefer to get content into player's hands as early as next week. Starting on March 5th, everyone who has pre-ordered the game on Steam will get immediate access to an alpha version of Arma 3 and its modding tools. If you prefer a try-before-you-buy option, Bohemia still has you covered: Just ask a friend who has purchased Arma 3 for an alpha of your own. According to Bohemia, early Arma 3 buyers will have the ability to invite non-paying customers into a limited version of the alpha. The free version won't support the paid alpha's modding and multiplayer capabilities, but it will showcase four singleplayer missions on a 20 square kilometer island near the Altis coast. If you cannot find a friend that will invite you to the alpha, access codes will also be circulating across various social channels and media outlets. 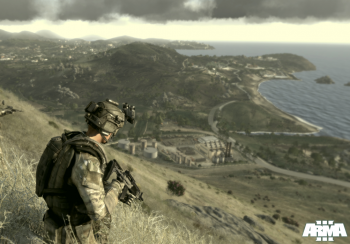 Arma 3's beta version will also become available for paying customers in Q2 2013. "The Arma 3 Alpha is a big milestone in the project's development," says Arma 3 Co-Creative Director Jay Crowe. "Testing early and often puts us on the right track towards improving performance, stability and delivering on our goal of creating a robust final release. It's also a big opportunity to get the game in the hands of our passionate community, which enables them to start work on their own creations, tailored to the fourth generation of the Real Virtuality engine." Arma 3's alpha launch is very well-timed, considering recent debates on the usefulness of game preorders. The games industry is being confronted with some hard questions about why preorders should be endorsed when the final quality of a game cannot be guaranteed. By offering customers immediate access to the alpha, and extending a free demo to their friends, Bohemia may have found a way to satisfy early purchasers and potential buyers alike. Being able to launch with a strong modding community at that point only sweetens the pot. Arma 3's alpha will be available starting March 5th with any purchase of the Arma 3 Alpha pack or Arma 3 Digital Deluxe Edition. Bohemia will support its free version of the alpha until June 15, 2013.